At Smiles Unlimited, we believe in creating a relationship with our patients that goes beyond the office doors. We've specially created this section of our site to share with you important news from our Belton family dental practice. Thank you to everyone that came out and participated in the Halloween Candy Buyback. All candy and oral hygiene products were sent to Operation Gratitude and will be placed in care packages for our troops overseas. 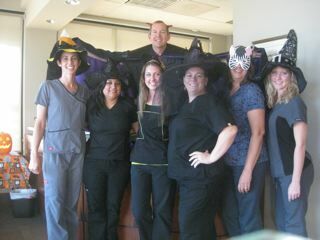 Our office collected over 75 pounds of candy and sent over 500 toothbrushes and 500 toothpastes to Operation Gratitude. Thank you for helping us make this a success!!! We look forward to participating next year. Dr. McNamara attended that American Dental Association Annual Meeting in San Francisco. At the meeting Dr. McNamara attended continuing education classes about implant dentistry, cosmetic dentistry, and gum disease. He was also updated on the latest technology and products at the exhibitors fair. He came back from the meeting with great ideas that are being incorporated to make sure we continue to have the most up-to-date office. The American Dental Association came up with a campaign for kids to "Stop Zombie Mouth". The Association is partnering with PopCap Games, makers of the popular "Plants vs. Zombies” video game, for the campaign to improve oral health habits among children and their families. Visit the website www.stopzombiemouth.com to see the Putrid Posse sing about oral health. Congratulations Jack!!!! You are the September winner of an Oral-B SmartSeries 5000 Electric Toothbrush. Thank you to everyone for the amazing testimonials we have received. It is truly an honor to have such wonderful and loyal patients!! Dr. Sullivan attended a continuing education class this month on root canal treatments. She was updated on the latest tips and trends in endodontics, as well as the latest technology. Dr. Sullivan has taken what she has learned in this class and integrated it into her practice. If you are in need of a root canal or have any questions about root canal treatments, please call our office. Congratulations Carla!! You are our August winner of an Oral-B SmartSeries 5000 Electric Toothbrush!! The benefits of simply switching your normal routine of using a manual toothbrush to an electric toothbrush are many. Powered toothbrushes maximize plaque removal since they are able to rotate or vibrate with more strokes per minute than by manually brushing. Greater plaque removal means a superior clean that will keep teeth and gums healthier with a fresh clean feel. Electric toothbrushes have shown to decrease gum recession and reduce inflammation. Most models have a timer to ensure adequate brushing time and multiple settings which can allow for a more specific kind of clean. A more thorough clean daily means less of a chance for bad bacteria to accumulate and cause cavities, bad breath, or other problems. Begin using a powered toothbrush today to experience the best at home clean and ensure a better dental check-up at your next routine visit. Lori celebrated her anniversary with Smiles Unlimited this month!! Lori has been with us for 4 years! Thank you Lori for your hard work and dedication!!! Smiles Unlimited would like to congratulate Lori, our hygienist, on the newest addition to her family. Welcome Carter Monroe!!! Born on August 14, 2012 at 7:55 a.m., 9lbs. 5 oz., 21" long. We wish you all the best!! * Visit the life stage sections to learn about oral health issues and tips for every member of your family. * Explore ADA Seal of Acceptance Products to help you decide which dental products are right for you and your family. * Search A-Z topics to learn about different dental issues and discover how you can prevent and/or treat these issues. Just click on the link below! !